This small worm can further research on probiotic function. This week on BBS: Work in microscopic worms reveals that probiotics can modulate virulence factor expression in pathogens, dietary fat influences the intestinal microbiota, and Lactobacilli supplementation reduces anxiety in a rat model. While clinical trials can teach us about the effectiveness of certain probiotics for the treatment and/or prevention of different diseases, these studies are less effective for learning precisely how probiotics function. Dr. Mengzhou Zhou of Jiangnan University in China, circumvented this problem by using Caenorhabditis elegans as a model organism to look at the pig pathogen, K88(+) enterotoxigenic Escherichia coli, responsible for causing diarrhea. 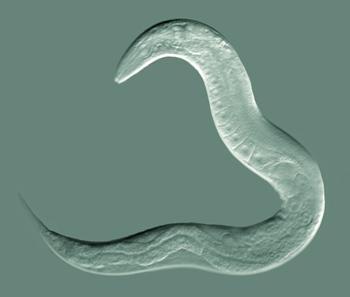 He found that C. elegans infected with the pathogen died, however, exposure to the probiotic Lactobacillus zeae LB1 protected approximately 86% of the worms. Lactobacillus zeae protected its host by preventing the pathogen from expressing harmful enterotoxins. Certain fats, like olive oil, are known to be healthful. Elaine Patterson of the Alimentary Pharmabiotic Centre in Ireland decided to investigate if these benefits extended to positive changes in the intestinal microbiota as well. To do this, she fed mice a number of different diets containing different fatty acid compositions and compared them to a low fat diet. She and her colleagues found that the microbiota in mice fed bad fats (palm oil) differed from those fed a good fat (olive oil). Palm oil lowered populations of the phylum Bacteroidetes. Furthermore, mice fed a flexseed/fish oil diet had increased numbers of Bifidobacteria as compared to the low fat control mice. There is evidence that probiotics can affect cognitive processes and anxiety. Dr. Jia Lou and researchers from the Chinese Academy of Sciences in Beijing now offer more evidence. Using a rat model for hepatic encephalopathy (a neuropsychological disorder caused by liver failure and the build up of toxins in the blood), they found that supplementation with Lactobacillus helveticus strain NS8 could reduce anxiety-like behavior and cognitive problems caused by the disease in the rats. Moreover, the probiotic reduced markers associated with inflammation. Zhou M, Yu H, Yin X, Sabour PM, Chen W, Gong J. Lactobacillus zeae Protects Caenorhabditis elegans from Enterotoxigenic Escherichia coli-Caused Death by Inhibiting Enterotoxin Gene Expression of the Pathogen. PLoS One 2014; 9(2): e89004.